A memorable and much-sought-after drama series from the mid-1970s, this ruggedly authentic thriller chronicles the sinister events that happen to two boys in Britain following the 1968 Prague Spring uprising. 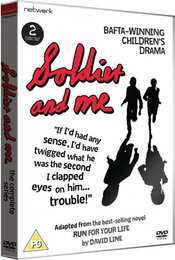 Adapting David Line's bestseller Run for Your Life, Soldier and Me was directed by Carol Wilks, a former World in Action researcher/director. It won the BAFTA award for Children's Drama.